Some of my more discerning readers may have noticed that there was no announcement about this week’s raw Tuesday take-aways. That’s because I’ve suspended them this week. Sorry to disappoint, but there are a few good reasons: first, I have an injury that is seriously cramping my cooking (or uncooking) style. Chopping and stirring are a bit painful- and carrying heavy bags of groceries is a mission. I’m trying to rest. Second, I’m doing some recipe testing (which is bad for the injury but c’est la vie), so there will be some great meals on the menu when take-aways resume. Third, Jozi Uncooked is quite busy with various catering events this week, so that’s where our attention is focused. But don’t worry, raw Tuesday take-aways will be back soon. In the mean time, here’s a recipe for a raw vegan spinach quiche. I looked over lots of different recipes on the internet and eventually just made up my own. I decided to try dehydrating in the oven (mine stays below 50 degrees C at the lowest setting). It actually worked pretty well. 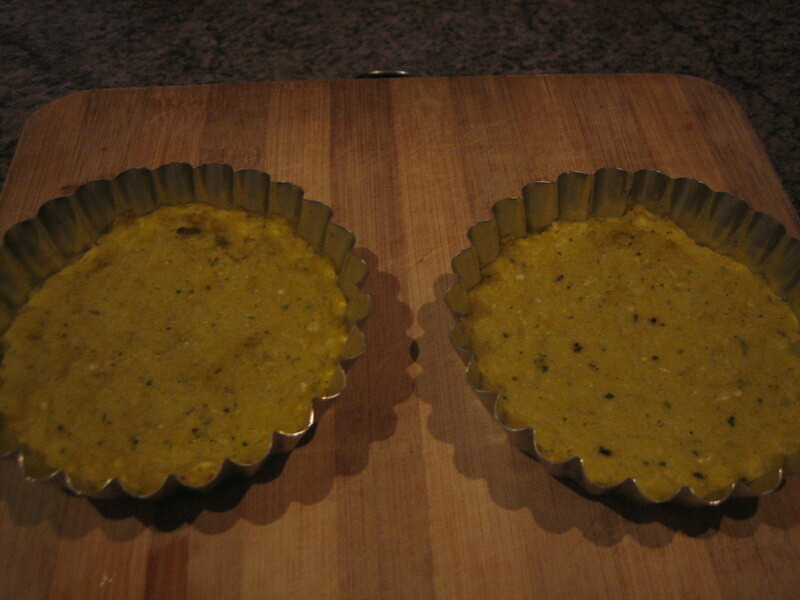 The base has a fresh corn/mealie/ vegetable taste, and the filling is spinach and cashew cheese. Enjoy. Instructions: blend all ingredients in blender or food processor until they make a thick but smooth dough. Press into the bases of 4 small tart tins and dehydrate at about 47 degrees C (116 F) for about 2 hours. Sorry the photo is a little dark. Instructions: Place shredded spinach in a bowl with olive oil, lemon juice and salt. Mix together and let stand for at least 1 hour (to soften spinach). To make cashew cheese, place soaked cashews in blender or food processor with remaining ingredients (except water) and process. Add water as needed to make a smooth, creamy cheese. Add spinach mixture to cashew cheese and blend until smooth. The filling will be a beautiful, green colour. Assembly: Spoon the spinach filling into the dehydrated bases. Put back in dehydrator for another 2 hours. You can eat the quiches warm out of the dehydrator, or put them in the refrigerator to set further. Serve garnished with fresh herbs or baby plum tomatoes. This entry was posted in main course, Raw Food, recipes and tagged Raw Food, raw spinach quiche, vegan recipe. Bookmark the permalink. It looks healthy and yummy.